Please refer to our stock # G0108 when inquiring. 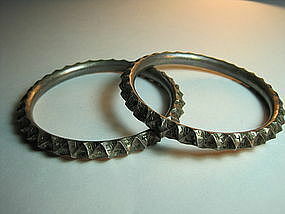 A pair of beautiful early 20th C. Chinese sterling silver bangles, with lots of good luck Chinese characters carved on the bangle, it's usually for birthday's gift in Chines tadition. In excellent condition. Signed. D: 2-1/4".